Swamini Amritananda is based in our Nelson centre and is heading activities there along with overseeing the activities all across New Zealand. Susan Spedding, hails from St. Heliers in Auckland and was brought up a Catholic. At the death of her father at the tender age of 10 years old, she found herself with many unanswered questions regarding life and death. These unanswered questions later kindled the embers of spirituality in her mind and soon they lead her to seeking answers to the shore of India. Having studied community nursing, Susan offered services to many voluntary institutions during her stay there. Her journey continued as Brahmacharini Bhakti Chaitanya, and she then found her home in 1995 in Nelson. In 2008, she took Sannyasa diksha (renunciation) and is known as Swamini Amritananda Saraswathi. Currently, Swamini Amritananda continues to be the the Acharya-in-charge of Chinmaya Mission Nelson. 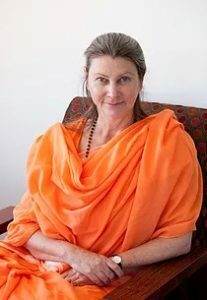 She runs the Mission’s activities in Nelson, where she conducts regular yoga classes, meditation sessions & Vedanta study group for adults & children. She is also a qualified YOGA teacher trained in Sivananda Yoga Centre, India.